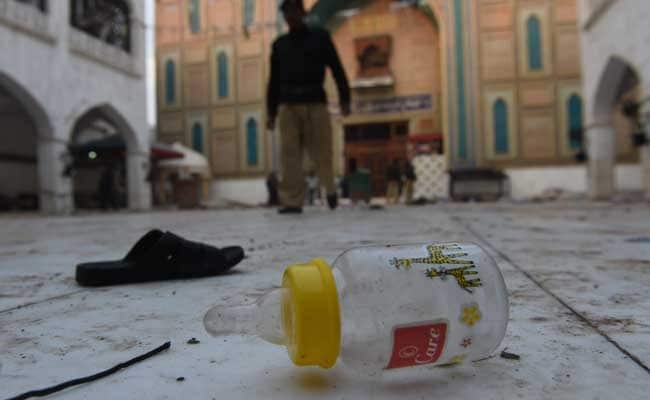 QUETTA: A suicide attacker blew himself up outside a Sufi shrine in southwest Pakistan Thursday, killing 18 people and wounding at least 27 others, officials said, as Muslims attended annual celebrations of a local saint. The incident follows a deadly bomb attack on the same shrine in the oil and gas rich Balochistan province in 2005, which killed 35 people. "A suicide bomber blew himself up after he was intercepted by police guards on duty outside the shrine, killing 18 people including three children under the age of 12 and two policemen, and wounding at least 27 others, 14 of them seriously," provincial home secretary Akbar Harifal told AFP. Members of Sunni and Shiite sects make daily visits to the shrine in Jhal Magsi district, with attendance climbing significantly during festivities. Harifal said the seriously injured patients were being airlifted to southern Sindh province in the absence of adequate medical facilities in restive Balochistan. The explosion triggered panic, with worshippers shouting and running in different directions, officials at the site told AFP. Limbs of the dead and injured lay in pools of blood. Provincial home minister Sarfaraz Bugti also confirmed the toll. "The suicide bomber struck outside the shrine at a time when it was packed with people attending anniversary celebrations of Syed Cheesal Shah," said senior local administration official Asad Kakar, referring to a local saint. Balochistan government spokesman Anwaar-ul-Haq Kakar said there were confirmed reports of a suicide attack. There was no immediate claim of responsibility but militants and separatists have repeatedly targeted minority Shiite Muslims at religious sites, as well as security officials. Balochistan is afflicted by Islamist militancy, sectarian violence and a separatist insurgency. Sectarian violence -- in particular by Sunni hardliners against Shiites who make up roughly 20 percent of Pakistan's 200 million people -- has claimed thousands of lives in the country over the past decade. Balochistan is the largest of Pakistan's four provinces, but its roughly seven million inhabitants have long complained they do not receive a fair share of its gas and mineral wealth. A greater push towards peace and development by Pakistani authorities has reduced violence considerably in recent years. Several million Muslims in Pakistan are still believed to follow Sufism, a mystical branch of Islam whose wandering holy men helped spread the religion throughout the Indian subcontinent in the 13th century.